tr, 5tr into centre tr on 5tr group, miss 2tr, * rpt from * to * to end, 1tr into top of 3ch. Turn. dtr, 5tr into centre tr on 5tr group, miss 2tr, * rpt from * to * to end, 1tr into top of 3ch. Turn. last 5tr group and 3ch, 5tr into centre tr of 5tr group, 1tr into top of 3ch. Turn. 5tr group and 3ch, 5tr into centre tr of 5tr group, 1tr into top of 3ch. Turn. Rpt last 2 rows until work measures approx 9.5” from shoulder or 10, 5tr group rows have been worked in all from yoke, ending with a Row 6. 3rd of 4ch. Fasten off. (You should have 13, 5tr group rows in all). of 3ch on beginning of each row (instead of working 1tr into top of 3ch) and turning after each row, you should have 11 rows in all from yoke or sleeve seam measures approx 5” from underarm. Fasten off. Turn. side with main colour and 4.00mm hook, work 42dc evenly up front edge, 3dc into corner, 51dc around neck edge, 3dc into corner and 42dc down 2nd front edge. Turn. Fasten off. with ss to first dc. Fasten off. into next loop, miss 1 loop, 1dc into next loop, * rpt from * to * to end. Fasten off. Turn. and ss into each dc to end. Fasten off. Finishing - Sew in and tie off loose ends of yarn. Sew on 3 buttons at yoke. Decorate with rosebuds and ribbon. Bonnet Using 4.00mm hook and main colour, make 59ch, 1tr into 4th ch from hook, 1tr into each ch to end. Turn (56tr + 3ch). Next Row - 3ch, 1tr into each tr to end, 1tr into top of 3ch. Turn. Rpt last row 6 more times making 8 rows in all turning at the end of each row. Fasten off. Turn. (approx 11 rows). Fasten off. from * to * to end. Turn. (14, 5tr groups). Turn. once, making 3, 5tr group rows in all. Fasten off. Turn. tr * rpt from * to * all across and including loose loops on centre panel to end. Turn. (14, 5tr groups). Turn. Work Pattern Row 7 from coat once (working into singles tr's not dtr's). Fasten off. Turn. end. Fasten off. Sew up side seams using loose loops on centre panel, turn through to RS. Turn back brim onto front of bonnet, with 4.00mm hook, starting at front with RS facing and main colour yarn make 3ch, work 1 row of tr stitch evenly along neck edge catching in brim on both sides of bonnet as you go. Fasten off. Turn. Join in contrast colour, 1ch, 1dc into base of 1ch, work 1dc into each tr to end. Fasten off. Finishing - Sew in and tie off any loose ends, thread ribbon through alternate tr’s at neck edge. Decorate with rosebuds. Booties - With main colour yarn, and 4.00mm hook make 28ch, 1dc into 2nd ch from hook, 1dc into each ch to end. Turn. (27dc). * to * to last 2dc, 2ch, miss 1dc, 1dc into last dc. Turn. a further 6 rows in dc on these 9 stitches. Fasten off. side of instep, 1dc into each of next 9dc along second side of ankle. Turn. Fasten off. 1dc over next 2dc, 1dc into last dc. Turn. dec 1dc over next 2dc, 1dc into next dc, dec 1dc over next 2dc, 1dc into next 13dc, dec 1dc over next 2dc, 1dc into last dc. Turn. dec 1dc over next 2dc, 1dc into next dc, dec 1dc over next 2dc, 1dc, into next 11dc, dec 1dc over next 2dc, 1dc into last dc. Turn. Next Row - 3ch, rpt Pattern Row 7 from coat (working into single tr not dtr). Fasten off. Turn. Rejoin contrast colour, with a ss into first dc, 1dc into each tr, slip stitch into each dtr to end, ss into top of 3ch. Fasten off. Finishing - With WS side facing, sew along open seam. Sew in and tie off any loose ends of yarn, turn through to RS. Thread ribbon through eyelet holes at ankle and decorate with rosebuds. 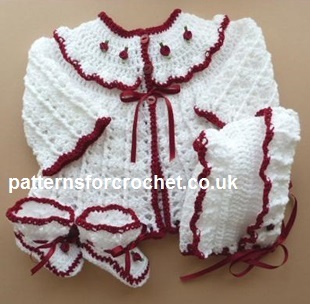 Hope you enjoy this free baby crochet pattern for a three piece set.